Noi is a bit of a portly fellow, just a tad over weight by human standards but perfectly in line with Bolian standards. Noi is blessed with an extremely adaptive and intelligent mind. He is blue, obviously, and like all Bolians, he is extremely sensitive about his physical appearance. He is always well shaven and well groomed, always clean. Noi is a typical Bolian. A free spirit, cheerful, happy, maybe at times even a tad eccentric. He is a jolly fellow, personified by smiles and laughter. He is a wonderful friend who loves to talk. He's a bit lacksadaisical when it come to work and can often be found day dreaming while on duty. A dreamy, happy spirit... this is Noi Dano Cole. Haircutting, cosmetics, cosmetic surgery, science, engineering, dabo, sleeping, parties, talking, drink making, chess, Bolian ale, selling, business, gambling. Noi was born under suspicious circumstances to Akari Dano and a woman whose name has been lost. He barely knew his father, a mysterious figure who served in the Bolian Spy Network. A year after his birth he was sent to live with some of his father's friends. He spent his entire childhood and adolescence on Bolarus 9 and grew up with a love of tinkering with gadgets. At around 18 years of age he started getting serious about Engineering and was accepted into a prestigious Bolian school. In 2380 he entered Starfleet Academy for an enlisted assignment. He spent two years there and received his certification in Engineering. He was assigned to Utopia Planitia Ship Yards on Mars to help with starship construction. He was promoted fairly quickly from Crewman Recruit to Crewman. In addition, he eventually he found Operations to be more to his liking and so he switched departments. 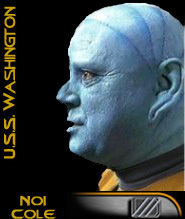 In the middle of 2384 he was given his first assignment onboard a starship, the USS Washington, where he is currently assigned.